Have you noticed that it can sometimes take a while to get an email notification on to the iPhone? The time it takes to check for new emails from mail servers is actually a simple settings option for some email providers, and this means it’s easy to speed up if you want to get alerts sooner and closer to the time the message was actually received. Again, this tip will only speed up accounts configured to Fetch, or for email accounts configured to check mail manually it will help a lot there too, unless you’re constantly refreshing the Mail app. The default setting in iOS is to fetch emails hourly, but that’s really not fast enough for some users, particularly if you’re expecting something important, you’re on call for work, or if you’d just prefer to get new data as fast as possible. There is a catch with having aggressive fetch settings however, and that is the potential to reduce battery life of the iPhone. This is made worse when the iPhone is in the wild on cellular networks, because the time it takes to open a connecting to a remote server through LTE, 3G/4G, or Edge 2G is going to vary widely depending on cell coverage, and each task runs in the background until completed. In fact, one of the common tips to improve battery life for an iPhone is the complete opposite of this, and to reduce the fetch setting to a higher interval. If battery life concerns you, be cautious of this setting, because it definitely does have an impact on how long a device will last, and you may want to change the setting according to your situation. That said, most of us keep our iPhones with us all the time and most of us aren’t too far from a charger either at work or home, so the faster mail deliveries are worth the trade off. By the way, this isn’t going to apply quite the same to those using different mail apps for different addresses, since individual iOS apps get pushes separately that are in turn handled through Settings > Notifications, but that’s really another topic. Push is instant, if you need things instantly there is no other way to go than push. This sounds like a good idea. Do you create a new mail account as Exchange with GMail credentials and anything more? I will try this later, thank you for the suggestion. Maybe OXD can write an article about this topic? As “martinoroberto” already said, setting up your gmail account via the “exchange account” setting on your iOS device means you can enable push, which is much much much better than fetch! Even better than push for GMail is the GMail app. It’s far superior, and you should use that for all your GMail accounts (well up to 4 anyway). Sure the built-in Mail app is nice since you can have many different accounts configured, but once you use the GMail app, you’ll change your mind, I promise. Every 15 min!? You forgot to mention that will eat battery life especially with more than 2 email accounts. I agree with Priley. Email push unnecessarily kills your battery. The only time I turn it on is if I am using my iPhone for work & awaiting an important email with a contract or something. 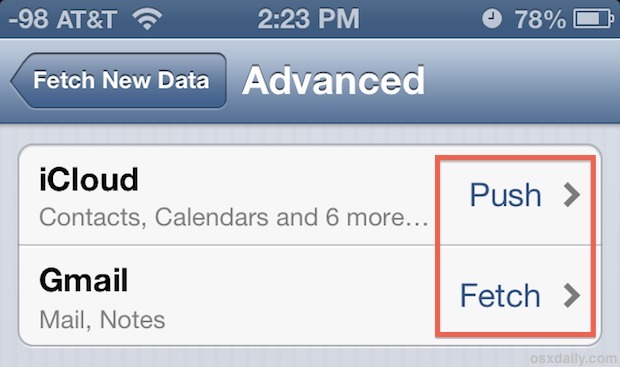 Otherwise I turn off email push along with other settings to maximize iPhone battery life. 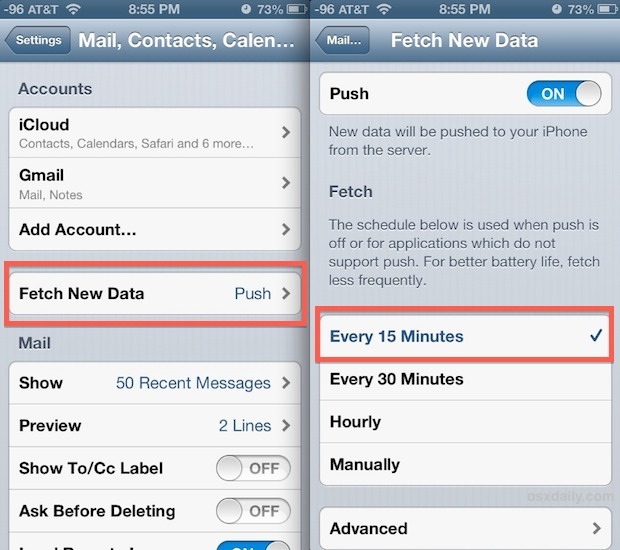 Use the “Push” option instead of “Fetch”, Push will drain your battery faster but when an email is found on the server it will ‘push’ it immediately to your iPhone, rather than ‘fetching’ every 15 minutes or so.